Claire Seneviratne - Ceramic Artist: Art greeting cards, set of 3, different designs. 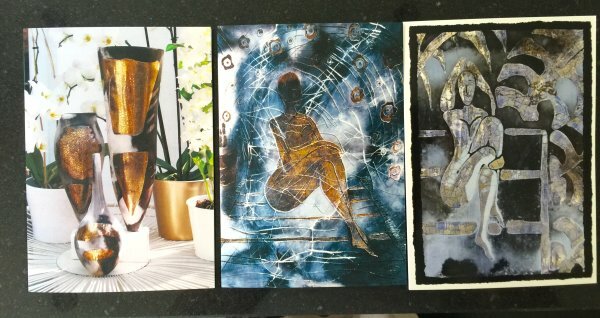 Art greeting cards, set of 3, different designs. Art greeting cards. Set of 3. 3 different designs. One is a photograph of my pots and orchids. The other two are photographs of two of my fire paintings 'Woman in Luxury' and 'Woman on Rug'. Blank on the inside so you can write your own message. The cards are 7x5 inches.